It’s no secret that I’m a fan of touring historic homes. I take tours on vacation and here in my own city. I’ve taken my children with me on these tours since they were toddlers and now that they are all teens, I can still convince them to explore with me. I will admit to you that my kids haven’t always been as …enthusiastic about these tours as I am. But they still reference things we have seen and learned at these homes all the time. So maybe your kids won’t be super excited to take a tour with you but, trust me, take them anyway. It’s one thing to learn about President Andrew Jackson in school. It’s quite another to walk down a staircase where Jackson once walked or see the kitchen where his food was prepared. If I can’t convince you to tour some of these wonderful homes with your kids, at least consider an adult outing to one or two. Have a day date with your spouse, spend an afternoon touring with your girlfriends or show off some of Middle Tennessee’s history to your out of town guests. The Hermitage (Map) is one of Nashville’s most famous historic homes. Tour the home, garden and tomb of our 7th President. Find information on touring The Hermitage at this link. Travellers Rest (Map) was built in 1799 and was the home of Judge John Overton. Find information on touring Travellers Rest at this link. Belle Meade Plantation (Map) is a Federal style house built in the 1820’s by John Harding. Find information on touring Belle Meade Plantation at this link. Belmont Mansion (Map) is an antebellum home built in 1849 by Adelicia Hayes Franklin and her husband, Joseph Alexander Smith Acklen. 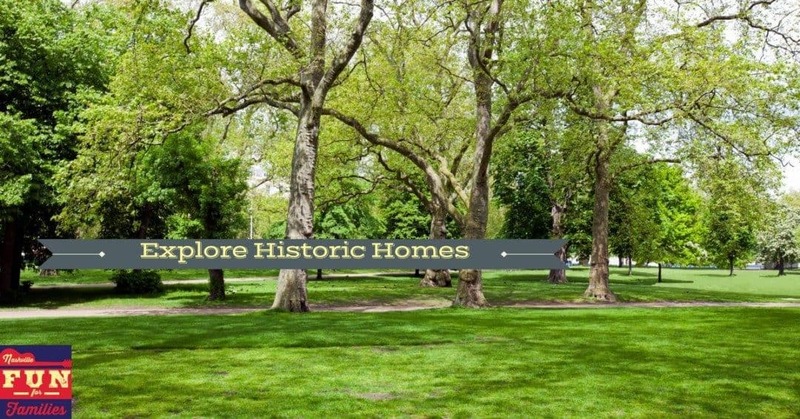 Find information on touring Belmont Mansion at this link. Two Rivers Mansion (Map) was built by David McGavock in 1859. This home is open for tours in June, July & August and also during the Christmas season. Find tour information at this link. The Croft House (Map) was built by Colonel Michael C. Dunn in 1810. The home has had several owners and renovations. It is now part of The Nashville Zoo. Home tours are available at different times throughout the year. Find tour information at this link. Cheekwood Mansion (Map) was built in 1932. The house features 36 rooms and a large art collection. Find touring information on Cheekwood Mansion at this link. The Buchanan Log House (Map) was built by James Buchanan in 1808. Tours generally begin in April and go through September. The Log House also hosts several family friendly events each year. Find tour information and events schedule at this link. The Sam Davis Home (Map) is the childhood home of Sam Davis,a ‘boy hero’ of the Civil War. The Greek Revival home was built in 1810 and renovated in 1850. Find information on touring the Sam Davis home at this link. Oaklands Mansion (Map) is an antebellum home built in 1815 and enlarged through the next two decades. Find information on touring Oaklands Mansion at this link. Rock Castle (Map) was built in 1784 by Daniel Smith who was a Revolutionary War colonel and one of Andrew Jackson’s best friends. Find information on touring Rock Castle at this link. Rose Mont (Map) is a Greek Revival home built in 1842 by Judge Josephus Conn Guild. Open for tours from mid April through October. Tour information can be found at this link. Cragfont (Map) was the home of General James Winchester, a soldier in the American Revolution and a General in the War of 1812. Cragfont was built in 1802. Open for tours from mid April through October. Tour information can be found at this link. Wynnewood (Map) is the oldest surviving log structure in Tennessee. The main building was constructed as a stagecoach terminal in 1828. Open for tours from mid April through October. Tour information can be found at this link. Bowen Plantation House (Map) was built in 1787 by William Bowen who received the land as an award for his service in the Revolutionary War. Tour information can be found at this link. Carnton (Map) was built in in 1826 by Randal McGavock. The home was used as a field hospital during the Battle of Franklin in 1864. Carter House (Map) was built by Fountain Branch Carter in 1830. The home was used as headquarters for the Twenty-Third Army Corps during the Battle of Franklin. Both of these homes and The Lotz House are owned by The Battle of Franklin Trust. Tour information for all locations can be found at this link. Rippaville Plantation (Map) is a mansion built in 1855 by Nathaniel and Susan Cheairs in the Greek Revival style. Find Rippaville tour information at this link.